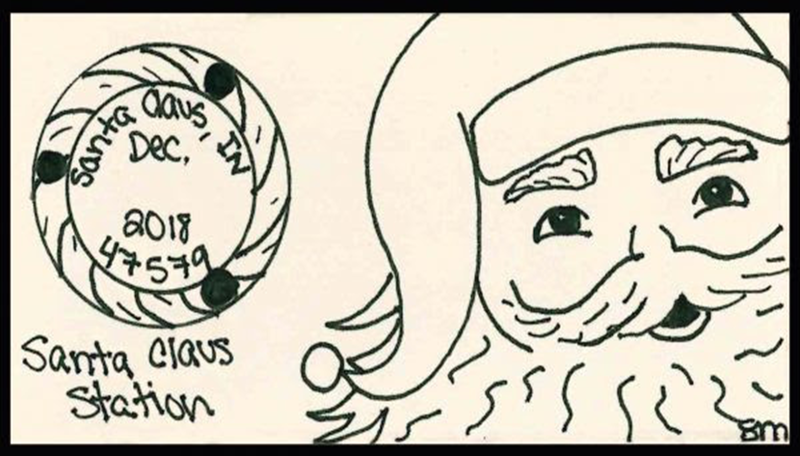 SANTA CLAUS -- The Santa Claus, Indiana, Post Office has selected the 2018 special picture postmark for the upcoming holiday season. On Saturday, December 1, the post office will begin offering the picture postmark to cancel the postage stamps on holiday mail again this year. This year’s artist is Savannah McCutchan, daughter of Tim and Holly of Lincoln City, Indiana. During her time at Heritage Hills High School, Savannah was involved in swimming, Beta Club, Optimist Club, Riley’s Dance Marathon, student council, and National Honor Society. Savannah is now in her freshman year at Western Kentucky University, where she studies communication disorders with a focus in speech language pathology. For information about Santa Claus Christmas Celebration holiday packages, call (888) 444-9252 or visitSantaClausInd.org/Packages.